Walk from Pant to Llanymynech via two countries, four pubs, Offa’s Dyke Way and the Montgomery Canal. 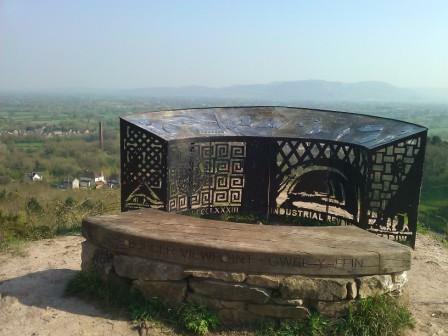 This walk from Pant to Llanymynech offers a superb way of exploring the Parish of Llanymynech and Pant whilst at the same time seeing some of the natural beauty of the area, its industrial heritage and local amenities. 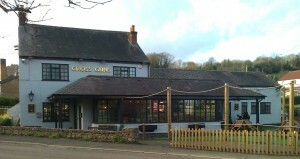 Starting point for this walk is the Cross Guns Inn in Pant (A). Leaving the pub to your left walk up Briggs Lane a few yards and turn into Rockwell Lane. At the top end of this lane you will find a public footpath and very soon you will be confronted with a galvanised gate on your right. 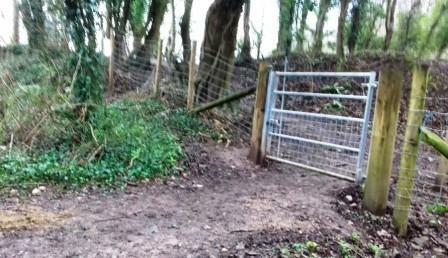 Go through this gate (B) and walk up the bed of a small stream – NB: check the depth of water if in doubt! In front of you, you will come to the face of a limestone quarry hidden in the trees. 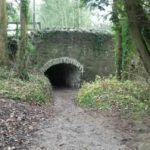 After you have explored here, return towards the stream, but this time leave the stream to your left and walk along a path that will take you to a main gravel path up towards Llanymynech Rocks. After a few minutes you will be in a flat area where wild orchids grow and climbers can be seen – obviously both weather dependent. Carry on along this gravel path and you will come to the top of the English Incline, marked by a big drum supported on two stone pillars. This drum was used to pull and lower wagons from the quarry back down the hill. Don’t descend at this point and carry on along the gravel path – from this point on it becomes much less flat underfoot. Very soon you will come face to face with a sign (C) pointing down the hill and a gate which marks the boundary between England and Wales. 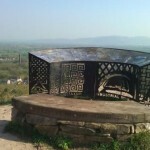 You can follow the footpath sign down at this point, but a short walk through the gate will take you to a fabulous viewpoint on your left (D) (Gwel-y-ffin) from where you can look towards Shropshire and the Wrekin to the left, Llanymynech and Welshpool ahead and Powys and Mid Wales to the right. Take the route back towards the gate but instead of going through it back into England, go right down the Welsh Incline. 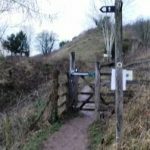 You will cross over the well know Offa’s Dyke footpath, but if you want to get to Llanymynech, avoid the temptation to take it – its 177 miles long in total. The Welsh incline too once saw wagons take limestone down to the Limeworks area below and you can still see marks on the stones caused by the rubbing of rope over the stonework. At the bottom of the incline you will need to turn left and cross a field and if you follow the well-worn path you will find yourself at a tunnel (E) under the A483. It’s pretty low, so be prepared to duck – especially important for anyone on a bike! 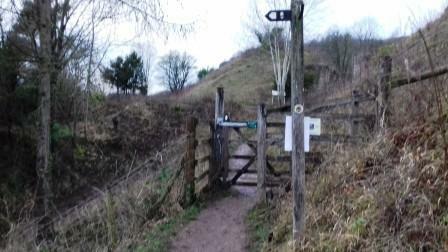 In a few more yards you will need to take a well appointed footpath to the right through the Limeworks Heritage area. 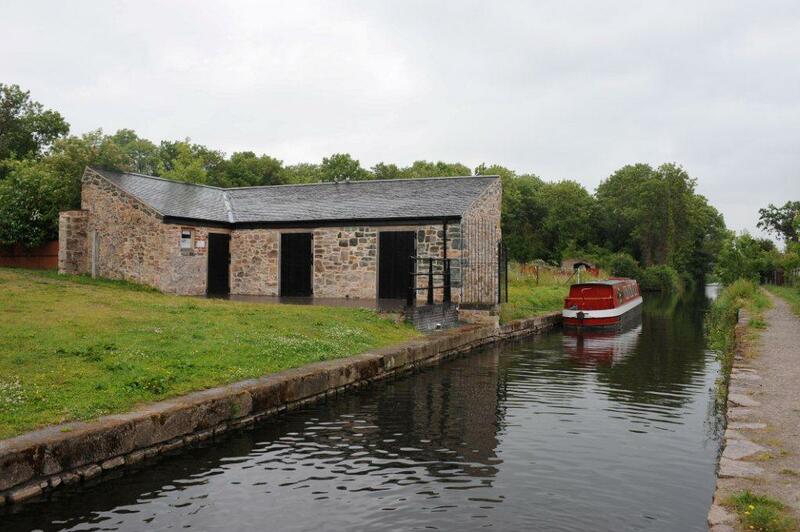 This area is full of signs of the area’s industrial heritage and it’s well worth taking a walk around. From the footpath you will see the chimney of the Hoffman Kiln, worth the diversion if you have the time. 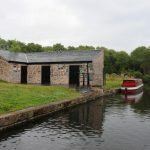 A few yards past the Stable Block you will need to turn right – straight on is to be avoided as it would lead you straight into the Montgomery Canal! Very soon you will be in the Limeworks Heritage Area car park and if you walk out of there and walk to the left on the pavement you will be in Llanymynech. Cross over the bridge over ‘the Monty’ and you will have three pubs – The Bradford Arms, the Dolphin and the Cross Keys – to choose from – as well as a village shop and food outlets. Once you have had your pint or something to eat, you have a number of options. If you have timed it right, you can take the bus back to Pant, you can take a look at St Agatha’s Church, visit Llanymynech Wharf Visitors Centre (F: check opening times), take the same route back to Pant or take the Montgomery Canal towpath back to Pant. The latter is very easy to find. 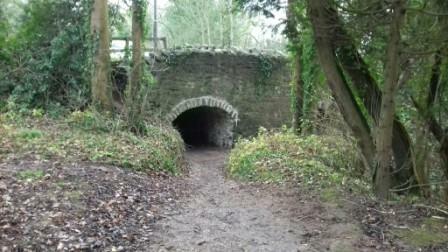 Walk back towards the bridge over the Montgomery Canal but don’t cross it. There are steps down to the towpath and right takes you back to Pant. Follow the towpath until you reach bridge number 90. Go under the bridge and then leave the towpath to walk round and go over the bridge onto the road. The road (Rhew Revel) back up to the A483 is rather steep, so take it slowly and when you get to the junction, turn right and walk along the pavement and cross the A483 when it is safe to do so. Now pop into the Cross Guns and pat yourself on the back for a walk that took you from Pant to Llanymynech and back again via two countries, four pubs, Offa’s Dyke Way and the Montgomery Canal. Distance about 3 – 5 miles depending on detours. Steep in parts. Not wheelchair accessible. 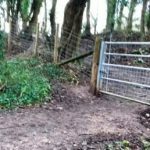 Please ensure you set off equipped for this walk, this is a guide only and some sections are off the footpath. If you spot any errors, please let us know.